Replicas of Hard to Find Skulls. 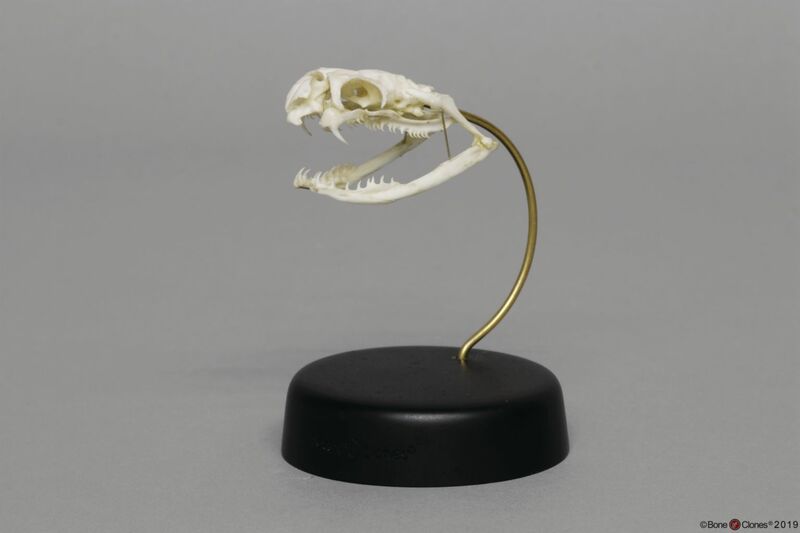 High quality casts from real skulls. 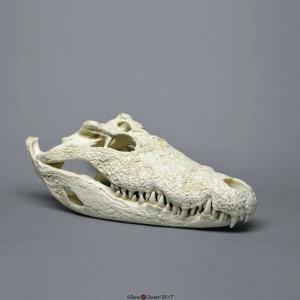 Nile Crocodile: The Nile crocodile, whose body shape has remained fairly constant over the last 65 million years, is a member of the group called archosaurs. Other members include dinosaurs, flying reptiles and ancestors of the world's birds. Nile crocs range over most of Africa south of the Sahara and the island of Madagascar where water can be found. They are one of the three species of crocodiles in Africa and one of the largest species of crocodilian found anywhere. Their brains and hearts are more advanced than other reptiles. Like birds, crocs have gizzards and a four-chambered heart. Crocodiles have 64-68 teeth. 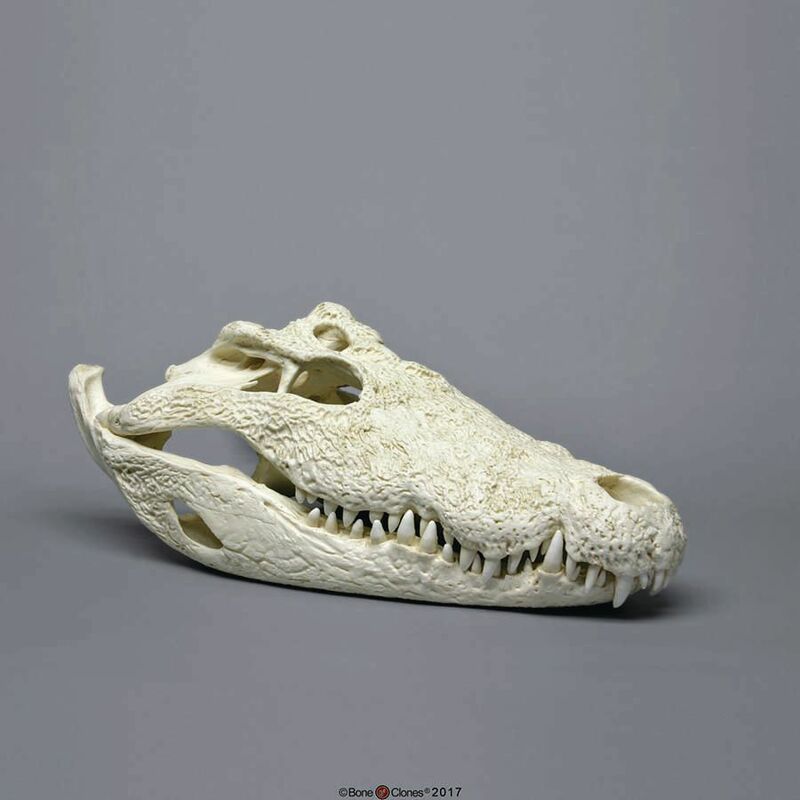 Their skin can readily be distinguished from alligators and caiman by the presence of the sensory 'dermal receptor pits' on the majority of their scales, which the latter only have around their jaws. Exceptional crocodiles have reached lengths of 20 feet and 2,000 pounds, but a size of 16 feet and 500 pounds is more common. Komodo Dragon: Komodo dragons are the heaviest and longest of the world's lizards growing to a length of 10 feet and weighing upwards of 300 pounds. 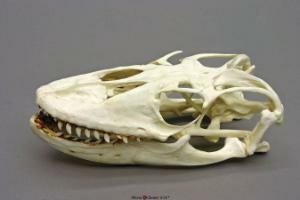 Their skulls are very similar to the extinct aquatic reptiles known as mosasaurs. 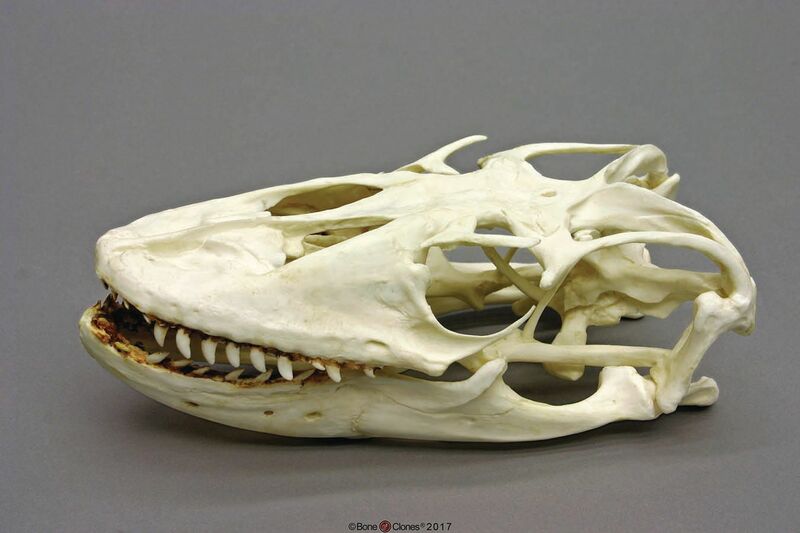 Mosasaurs and monitor lizards are not closely related but belong to the subclass Diapsida with origins about 300 m.y.a. during the late Carboniferous Period. Monitor lizards are related to Lepidosauria, which emerged near the end of the Paleozoic 250 m.y.a. The genus Varanus first appeared 40 m.y.a in Asia. They migrated to Australia when it collided with Southeast Asia about 15 m.y.a. A second lineage evolved and moved throughout Australia and the Indonesian archipelago approximately 12 m.y.a. This lineage retains a prominent presence today. 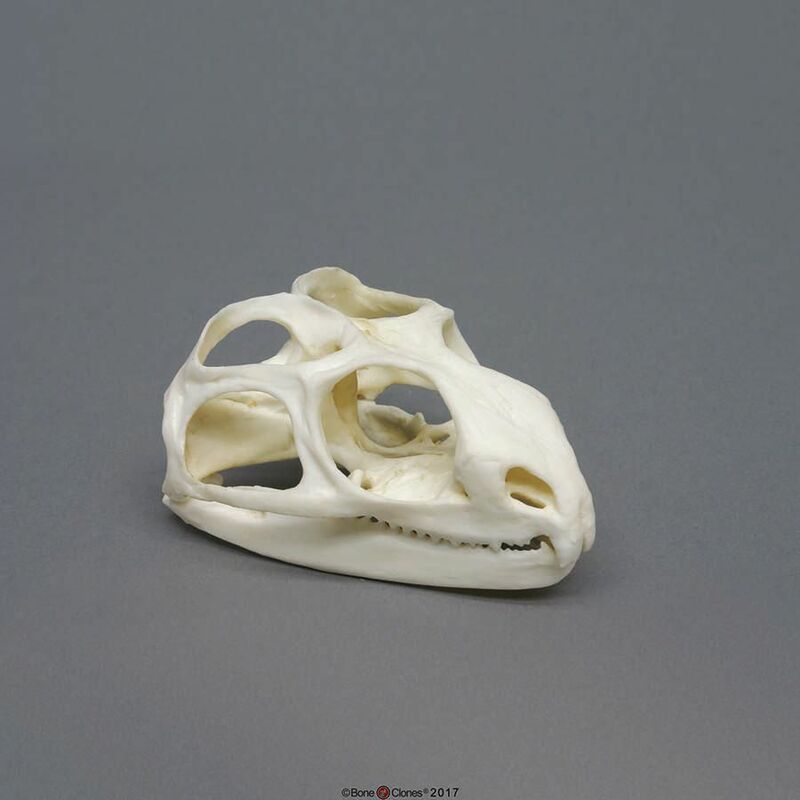 The Komodo dragon differentiated from its earliest Australian ancestors about 4 m.y.a.. They were able to migrate to their present range on the Indonesian islands of Flores, Rinca and Gila Motang and finally to Komodo Island about 10,000 to 20,000 years ago, when sea levels were lower during the last ice age. Gila Monster: The Gila monster (Heloderma suspectum) and the Beaded lizard (Heloderma horridum) are the only two lizard species in the world that are venomous. The Gila monster is a large lizard native to the southwestern portion of the North American continent. 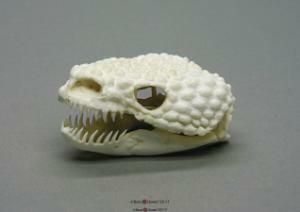 This skull is cast from a large and old specimen with excellent teeth and epidermal knobs. It can be found in terrestrial arid areas, deserts and dry forests in Arizona, New Mexico, Nevada, Southern California, and Northern Mexico. Reaching around 19 inches (48 cm) in total body length, this lizard has a stout tail and is covered with thick scales that resemble beads with an irregular pattern of yellow, orange and brown bands or spots. Gila monsters do not strike like a snake. Instead it holds on with a vise-like grip and "chews" in the venom, which is secreted from glands in the lower jaw and distributed by grooved teeth unlike snakes which inject with fangs like hypodermic needles. Gila monsters have neurotoxic venom, which affect the nerves. This cast would be a great addition to any biology program focused on venomous animals.